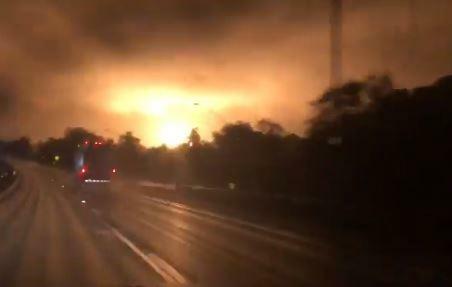 A gas line explosion lit up the sky vivid orange early Monday morning outside Pittsburgh. CBS Pittsburgh reporter Meghan Schiller, who caught video of flames shooting skyward as she made her way to the scene of the incident, said authorities in Center Township, Pennsylvania, were evacuating the area around the blast. Emergency dispatchers reached by CBS News said there were no immediate reports of injuries. They confirmed a half-mile radius area around the blast was being evacuated. The first call about the explosion to the emergency services came in at 4:54 a.m. Eastern. Energy Transfer owns and operates the pipeline. They said its valves were turned off and the fire was distinguished by 7 a.m.
About 25-30 homes in the area were evacuated Monday, Center Township Police Chief Barry Kramer said in a news conference. Kramer said some of the evacuees required medical assistance, not because of injuries but because of "medical conditions out of their homes." A home, two garages and several vehicles were destroyed in the fire, CBS Pittsburgh reports. The Central Valley school district canceled Monday classes and Interstate 376 was closed due to falling power lines. Center Township is less than 20 miles northwest of Pittsburgh.